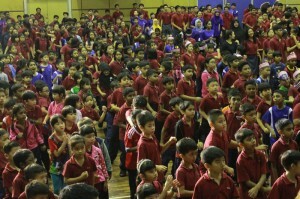 In conjunction with this year’s Independence Day and Malaysia Day, R.E.A.L Schools, Shah Alam Campus held its very own Merdeka Day celebration on 30th September. Over 200 students from both the international and national sections of the school joined in the celebrations which aimed to raise awareness among the younger generation on the true meaning of ‘independence’. The event was also dedicated towards cultivating a spirit of patriotism and nurturing a love for the country. A variety of activities and student performances were carried out on the day; which included poem recitation and a traditional dance numbers. An aerobics session kicked off proceedings which got the teachers’ and students’ blood flowing early in the morning. Arguably the main highlight of the day was the performance by the cheeky toddlers of R.E.A.L Kids, Shah Alam Campus. Their adorable stage presence delighted the audience as they tickled both young and old with their antics. The various performances were interwoven with 10 slots of video presentation which went a long way in instilling a sense of appreciation, unity and devotion towards creating a harmonious nation. 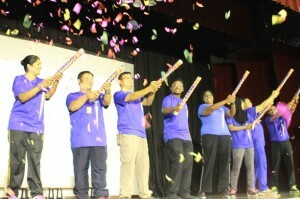 Prior to the event, the campus even held a Merdeka-themed classroom decorating competition as well as a T-shirt and banner designing contest which only added to the fun, fervour and festivities. On a more serious and significant note, Merdeka Day celebrations are a way for us Malaysians to commemorate our freedom after more than four centuries of colonization and to reflect on how far we have come since independence. It is to remind us of the hardships and sacrifices our forefathers had to endure while fighting for our beloved motherland. For the benefit of today’s younger generation and future generations to come, it is vital for all schools to play a role in developing a patriotic society by imparting the right values, knowledge and understanding on the true meaning of Merdeka. The post Shah Alam Campus Community Converge to Mark ‘Merdeka’ appeared first on best international schools in malaysia.